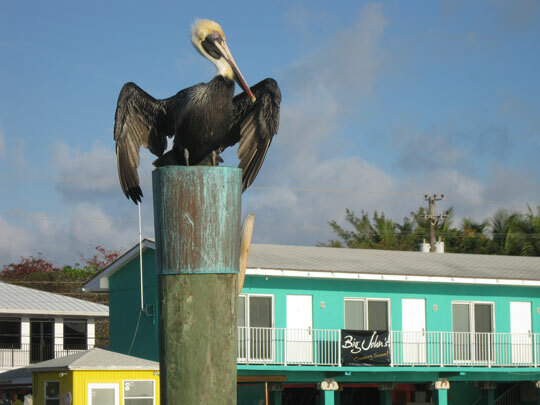 Brown Pelicans love to roost on the pilings in Bimini. Bimini has such a light cherry name. It is sing-songy to say. It conjures up everything you imagine the Bahamas to be – bright, airy, paradise. Unfortunately Bimini is not as it sounds. Bimini is the closest Bahamian island to the US. 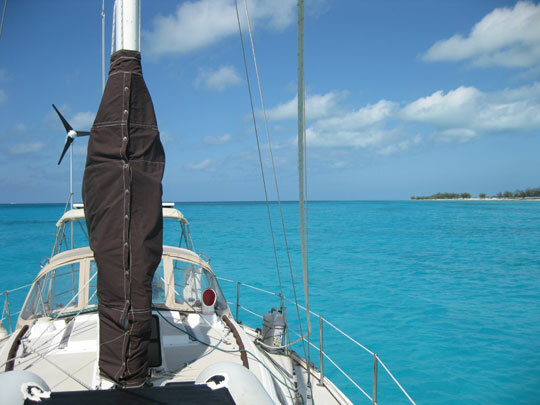 More boaters pass through customs here than any other island in the Bahamas. Sailboats come in, check in, pay their fee and sail out – some not even staying for more time than process of customs takes. Most of Bimini’s marinas are small, no frills. A cold shower might be the best amenity you get. But then there is Big Game Marina, much larger, with a restaurant, gift shop, hotel and no doubt hot showers. This is a much pricier marina that caters to fishermen who power over from Miami for the weekend on their enormous fishing boats. You can spot these visitors in Alice Town’s main drag in Bimini riding in their rented golf carts wearing their pressed button down shirts and pleated shorts buying beer (expensive!) at the liquor store or shopping at the 5 or 6 shops in a row that sell the same identical tied dyed Kalik (the Bahamian national beer) t-shirt. Quite a contrast from us “grotty yachtys” wandering around just trying to find customs. My initial assessment of Bimini was that it was sad. It held none of the charm or character of other Caribbean countries or anywhere else in the Bahamas that I had visited before. It seemed like pieces of it were missing. And in a way they were. The government dock was missing. It had been torn down and they were busily reconstructing it. The restaurant next to Brown’s marina were we stayed the first two nights was also in the midst of being gutted and rebuilt. On our stroll on the beach we encountered structures seemingly half built and abandoned, big houses unoccupied and the remains of what was probably a nice home piled up in the sand. 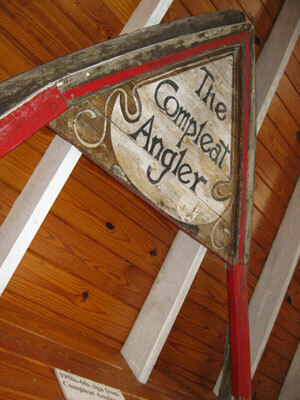 Perhaps all that is left of the Compleat Angler hangs in the Bimini museum. In town, Hemingway’s favorite hangout, The Compleat Angler, lay in ruins, destroyed by a fire. This must be a big disappointment for “Papa’s” fans that hope to hoist a beer and feel lingering presence of the man only to find a few crumbling walls and a fireplace rising in the midst of them. There are many ruins of boats to be seen around the island. In the anchorage next to Big Game marina you can see two boat hulls under the water that look like rather large rusty canoes. And on the southeast point of the island, up the hill to the right of the graveyard there is a rather large rusting wreck of a boat broken and stranded on the beach. But it isn’t just places and boats that are missing in Bimini. It is people too. During our initial stay at Brown’s marina, the marina managers, Mike and Amy, had to unexpectedly leave do to an immigration situation. This was Friday and they said they only needed to check in to the States and would be back by Monday. When we returned to Bimini that next Thursday after our trip to Cat and Gun Cays, they still hadn’t returned. No one knew if they would. But perhaps missing people is not so unusual. After carting our half full tank of propane halfway across the island we learned that the propane guy hadn’t been seen in a week in a half. No one seemed too concerned. My feeling of sadness about Bimini abated a little after our trip to the Museum. We were under the impression that the museum had been closed for two days due to wet paint sign in front of the stairs, but once we saw the door to the museum was open, we ignored the wet paint sign and went on up. Bimini once flourished. They did very well during the US prohibition as a jumping off point for smuggling alcohol to the States. Many prominent people once lived here and visited. The Reverend Martin Luther King Jr. visited often and wrote his Nobel Prize acceptance speech here. In better times Bimini thrived with live music and clubs. And Bimini is awful proud of their fishermen and the big fish they have caught. Four walls of this tiny museum are dedicated to them. No doubt Bimini has been hurt by the downturn in the US economy. Our visit was during the slow time of the year. I hear things pick up in the summer. The government dock and the restaurant near Brown’s will be done by then. Maybe Mike and Amy will return or at least, hopefully, the propane guy. Maybe the economy will pick up and more Big Fishermen will power in for the weekend and more “grotty yachtys” will sail in and stay a night or two before they head back out. There are lots of places in Bimini that we did not visit. We spent all of our time in Alice Town and did not visit Bayley Town at all, which according to the cruise guide might be interesting. Bayley Town was not in walking distance and the tram cost $3 for each person, each way – $12 for us and too far out of our budget. We also did not visit any of the restaurants – out of our budget. But there were many things I liked about the island and would recommend for a return visit. Brown’s marina was fine despite having only a cold shower (and maybe no showers now as after Mike and Amy left, it seems the key to the shower could not be located). There is a tiki bar on the dock at Brown’s with a nice enough bartender, Henry, and free wifi. There are quite a few small grocery stores, but our favorite was a good hike away from the marina on the other end of Alice Town, Robert’s Grocery. The woman who ran it was very nice. She had a good selection of produce including to my surprise, tomatoes. Also the sweet potato bread she sells for her friend is very good! The General Store is worth stopping into even if there is nothing you need to buy. But if you do need anything for your boat it is probably here in this seeming unorganized shop about the size of a large office cubical. Just ask the red headed woman who runs the shop. She appears to know where everything is as well as being able to demonstrate how to use a spear sling if you are curious. If the shop is not open she is most likely off having fun. There are several hole-in-the-wall type bars patronized by locals. The End of the World Bar looked interesting, but unfortunately we were too tired when we passed by to check it out. There was a big sign on the out side of it that says, “No Smoking”. We will have to check it out if we come back. I wish I had my camera when we saw the boat wreck on the beach, but we were too busy looking for the missing propane guy and I had left my camera on Blue Wing. It is a must see again if we go back. Although beer is expensive, you can get a liter of gold rum for $8 and the Guinness extra special beer is high gravity, so it is like buying two for one. There is a good anchorage for boats like us with deep drafts up a dredged channel nestled between a big pile of dirt and a resort on the north end of Bimini in Bayley Town. It was quiet and calm. If you need fuel during your stay, a friendly guy at the Shell fuel dock will watch you while you spend an hour pumping diesel and entertain your wife by showing her how to play a ring toss game. Oh, and another thing interesting to note. While we were at Brown’s we saw the cutest little wooden sailboat. It bobbed up and down in its slip like a cork on the ocean. It was probably only 20 feet long. A couple was living on it. Unfortunately I did not get a picture of it or a chance to talk to its occupants, but as it sailed away we noticed its hailing port (our Greenville friends should appreciate this) was Tuxedo, North Carolina! I hope we run across them again. On the day before we left to head for the Berry Islands we discovered Paradise Point. Located on the northeastern coast of the island it is a nice welcoming beach with all of its structures intact and amazing blue water. It looked like paradise. Finally, the image that the sound of Bimini conjures up in my mind. Wow we finally found paridise! Unfortunately this was the last of it we would see for a while. Hey – thanks for the offer of the solar shower. We had two solar showers. We lost one that was tied to the deck and went overboard when we were in rough waters crossing through the inlet between Gun and Cat Cays. We have a small one, which works well, since we need to conserve water and don’t want to run out before we are able to fill up again. Thank you for taking the time to update this blog. Just replying to let you know it is being read. I enjoy your insight and sharing your real life experiences. Next time you hit Bimini make sure you’ve read 1421 by Gavin Menzies about the Chinese discovering America. There are some comments about Bimini and the possible haul out rocks for the junks and some wrecks there. Interesting! He was a submarine commander in the Royal Navy and has interesting navigation comments also. Just the thing for sailors to read. John, I remember reading “1421” shortly after it came out. Very interesting. We did sail over the “Road to Atlantis” in Bimini. I would like to dive and take a closer look when it gets warmer. It’s intriguing to think the stones could have been ballasts for huge Chinese junks. I can’t remember why the author said the north atlantic Chinese fleet didn’t find a sea route to Europe. Maybe they were sunk by bad weather. I’ve been meaning to go to his website to look for more current info supporting his theory. Thanks for the reminder!